When a Danish cargo ship carrying Danish widgets or Copenhagen cargo of some undefined value gets hijacked, the seven crew members go from employees to pirate assets. The job of the CEO of the cargo fleet, Peter (Søren Malling), is to purchase those assets back at the best possible rate. This isn’t just a matter of money; if the company bends too easily to the pirate demands, the pirates just demand more. So the negotiation begins between the Somali’s translator, Omar (Abdihakin Asgar), and a high-powered business executive who is introduced to us in a scene where he more or less depants a rival during a deal. There’s no reason to believe Peter isn’t up to the challenge of getting these “savages” to take a reasonable offer. Only, Peter’s never trafficked in human life before. As the first offers begin stunningly far apart with the pirates asking $15 million and Peter offering $500,000, the series of phone calls become increasingly frantic and desperate for both parties. The crew of the MV Rozen, most notably Mikkel (Pilou Asbæk), the ship’s cook, start to suffer in the cramped, tense conditions. Maybe that’s because the negotiations take months and months and months to get going. In American fiction, our hostage situations end with a shootout by the end of the hour-long TV episode. Reality is a little different. But wait, you think, this isn’t reality… And while this is a dramatic retelling, the hostage negotiator Connor was played by actual hostage negotiator Gary Skjoldmose-Porter. Not impressed? Well four of the crewmembers of the MV Rozen were played by actual crewmembers of the MV Rozen who were actually hijacked by Somali pirates in 2007. There’s a good chance that the reason things feel so authentic is because these people were vividly remembering as much as they were reenacting. It’s stunning to watch the flippant, cocky Peter go from a “let’s get this deal done” glorified used car salesman to a broken down shell of himself, desperate to keep fathers and husbands alive. 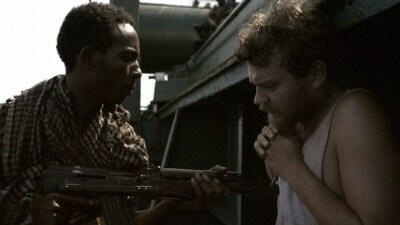 But it’s equally as gripping to see Mikkel go from burly boatman to zombified PTSD victim. Sparse, nerve-wracking and far too genuine for comfort, A Hijacking is one of those movies that must be recommended even if it’s in a way that doesn’t suggest that watching it will be much fun at all.